The EDGE Green building rating system; certification made easy. “The EDGE organization has looked at the article and they are requesting we post a corrected version to convey information more accurately.”. Below is corrected/revised Article posted on 26 Jan 2018 . EDGE (Excellence in Design for Greater Efficiencies) is a green building certification system that enables design teams and project owners to assess the most cost effective ways to incorporate energy and water saving options into their buildings. An innovation of International Finance Corporation (IFC), , a member of the World Bank Group, EDGE is comprised of a web-based software application, a universal standard and a certification system. If you earn a minimum prediction of 20% less energy, water and embodied energy in materials, then your project can met the EDGE standard. EDGE designed buildings are currently saving 75,722 MWH/year of energy, 1,802,700 M3 of water, and 320,554 GJ in embodied energy around the world. Sustainable buildings clearly have impact, from corporate bottom lines to homeowners’ pockets. The EDGE software and certification system are measurable ways for architects and developers to optimize their designs, leading to a more investment-worthy and marketable products. Building design teams can now adopt a quantitative approach, as the EDGE app uses localized costs and climate data for site-specific results. EDGE can be used for all stages of a project’s life cycle – from the pivotal moment when design is born, straight through to on-site decision-making. The EDGE certification process is a simple system that has only three categories to meet requirements for: energy, water, and materials. The software is relatively easy to master for most designers. Once the sustainable elements are ticked off on the EDGE app, the project gathers the appropriate documentation, registers the project with the EDGE certification provider (usually GBCI – Green Business Certification Institute) and passes their EDGE Auditor’s review to qualify. Certification can be achieved mainly with existing project documentation. Hence costs to certify an EDGE project are relatively inexpensive. The client firsts uploads their project data onto the free EDGE app online. It is then the Client’s responsibility to check that the building project design meets the EDGE Standard, and they can do this at the planning stage by using the EDGE app to model different scenarios with a variety of measures if they choose. Once they have finalized their design in the EDGE app, the details of the energy savings, water savings and embodied energy of material savings are calculated. The client then registers their project with the relevant EDGE Partner. The client may want to hire an EDGE Expert consultant to guide them with the sustainability design of their project and provide assistance with uploading the project data to the EDGE software. An EDGE Expert can also provide guidance for the project during design and construction to gather the needed documentation for submission. Next, the Client selects an Auditor. Clients are responsible for paying EDGE Certification Fees to the certification provider, and appointing an approved EDGE Auditor. The potential EDGE Client separately negotiates fees with the Auditor. Clients are also responsible for the factual accuracy of the certification application. Note that an EDGE Expert and EDGE Auditor cannot be the same consultant as this is seen as a conflict of interest. Next, the Client selects an Auditor. Clients are responsible for paying EDGE Certification Fees to the Partner, and appointing an approved EDGE Auditor. The potential EDGE Client separately negotiates fees with the Auditor. Clients are also responsible for the factual accuracy of the certification application. Note that an EDGE Expert and EDGE Auditor cannot be the same consultant as this is seen as a conflict of interest. The EDGE Auditor is responsible for conducting a Design Audit, which includes a review of the self-assessment (the entries in the EDGE app) and its accompanying documentation. If the Auditor is satisfied that the project design meets the EDGE Standard, they will make a recommendation to the EDGE certification provider for Preliminary Certification. The certification provider then checks to make sure that the Design Audit is complete, and if so, issues a Preliminary Certificate for the building project. At the completion of the building project, an EDGE Auditor will undertake a Site Audit to ensure that the completed building includes the EDGE measures that were set out in the design. 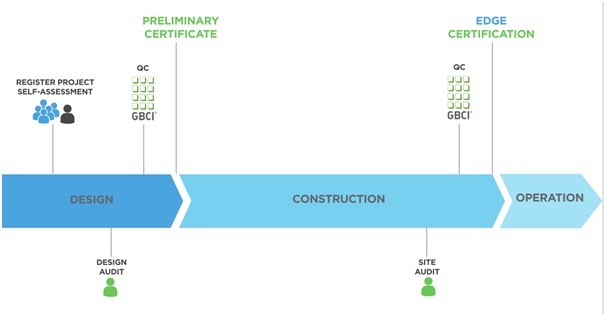 If the Auditor is satisfied after the Site Audit that the completed building meets the EDGE Standard, they will make a recommendation to the certification provider for EDGE Certification. The Partner then checks to make sure that the Site Audit is complete, and if so, issues an EDGE Certification for the building project. The EDGE Building system is available for many project types. It can also be applied to existing buildings. The existing project will also need to provide the documentation to verify the features were installed in the building. Reasons are plentiful to opt for a resource-efficient commercial building. Tenants and guests will appreciate the value proposition of lower operational costs. Lower break-even occupancy rates will protect against market variability. And investors will respond well to a strong balance sheet. The EDGE software provides an opportunity to explore technical options while viewing capital expenses and utility savings. Extra capex of just two percent has been known to produce savings greater than 10 times the initial cost of building green. In addition, the building itself will command greater market value due to its ability to deliver on the operational front. Sends a positive signal to investors. Drives profitability that leads to expansion. Ensures cost control and consistency across properties. Complements efficiencies in construction and labor. Contributes to a brand of corporate sustainability. Smart homebuyers understand the tangible benefits that owning a green home brings. Through such sensible solutions as low-energy lighting, thermal glass, and water-conserving fixtures, developers can meet the expectations of consumers who want to save money while living in comfortable spaces with good ventilation and abundant daylight. EDGE-certified homes attract prospective buyers who understand the long-term value of their investment in a green residence, with its lower utility bills and higher re-sale price. Homeowners also believe in the sense of fulfillment that comes with making a responsible choice. Developers can capitalize on these advantages and aspirations to win new customers and promote their brand. EDGE-certified hotels – sustainability sells. By using the EDGE software at the design stage, a hotel developer already knows the numbers in order to respond to discerning guests. And by achieving EDGE certification, the developer has proof of going beyond self-regulation to become a truly resource-efficient enterprise. Such factors as the hotel’s star rating, the occupancy rate and whether there are laundry services all come into play when creating a base case model within EDGE. This numeric approach to design is one that any corporate leader can understand – and what can be easily understood at the top can be rapidly set in motion. Simply put, sustainability means a better bottom line, as utilities savings of 20% or more can help hotel owners fight for that last 2% of profitability. That is why for hotels in emerging markets, EDGE is a tool for survival.